So my reading last week was a little heavy and this week I thought I needed to lighten up a little. But my at-home to-read bookshelves did not have much in the way of light reading, so I took a jaunt down to my public library. 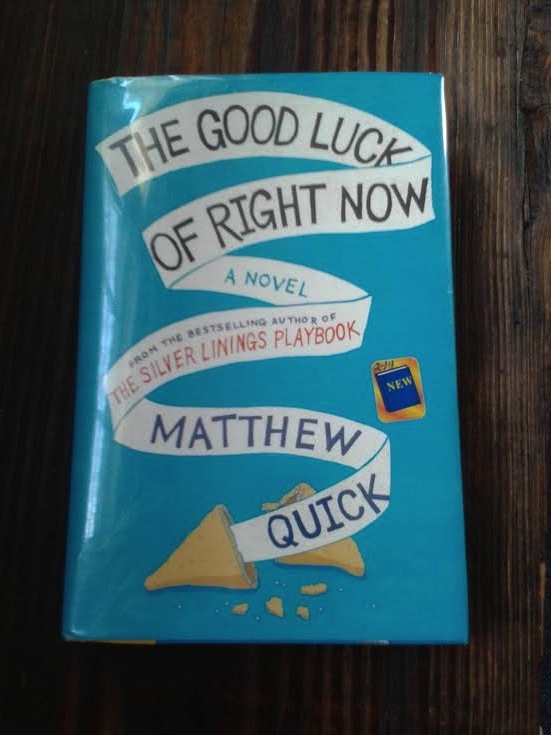 There, on the new fiction shelf, stood my serendipitous find: The Good Luck of Right Now by Matthew Quick. You’ve probably never heard of Matthew Quick. I hadn’t, at least. But the book cover proudly proclaimed he was also the author of The Silver Linings Playbook. Now, I haven’t actually read that book, but I did see the movie (I know, I sound like my students). But anyone who can write a scene about a man loving a book so much that he throws it out a window and wakes up the neighborhood is an author whose books I am certain to love. I read this book all in one Sunday afternoon sitting–it was hard not put down–and when I was done, I wanted to go rent An Officer and a Gentleman, with Richard Gere. That might sound strange at first, until I tell you that this is an epistolary novel, where the protagonist, Bartholomew Neil, writes letters to Richard Gere. He writes them to Richard because after his mother died, he found a letter from Richard Gere in one of her drawers and decides to confide in him about his life. Bartholomew’s life is not terribly unusual. He visits the library often, where he uses the internet, notes interesting things in his notebook, talks to his good friend Father McNamee, and fantasizes about taking the Girlbrarian on a date (or just talking to her, even). I enjoyed this book for many reasons. While it is written with a light touch, and reads quickly, it explores the idea of grief, of developing as a full human being, of religion, or friendship, and of happiness. Bartholomew does some research into Buddhism, since Richard Gere is a Buddhist, and there are sayings from the Dalai Lama peppered throughout the book. Bartholomew has also read Jung, and writes about the idea of synchronicity throughout. But these quotes and ideas are mixed in with his mother’s theory, about The Good Luck of Right Now, which is downright transcendental. Her idea is this: “whenever something bad happens to us, something good happens–often to someone else.” This idea of the balance of the universe allows her to remain cheerful during tragedy and, as Bartholomew states early on in the book: “Mom could make small things seem miraculous. That was her talent.” She celebrated little things: “like finding a forgotten wrinkled dollar in a lint-ridden coat pocket, or when there was no line at the post office and the stamp sellers were up for smiles and polite conversation, or when it was cool enough to sit out back during a hot summer–when the temperature dips dramatically at night even though the weatherman has predicted unbearable humidity and heat, and therefore the evening becomes an unexpected gift.” Now that’s a life philosophy I can appreciate. So if you’re looking for a quick read with a light touch, where the end is hopeful and fulfilling, check out The Good Luck of Right Now. Hopefully they’ll make this into a movie, too. I’m motivated to pick up the book of Silver Linings Playbook since I enjoyed Quick’s prose so much in this one. Happy reading, and don’t stay up too late!